Even if you are traveling to Mallorca by plane or boat, it is most likely that you need to use a car to move around the island… better to rent a car than randomly asking for a ride! Mallorca is a wonderful destination, where renting a car is something that must be done carefully in order to have a good experience. On an island where everyone needs a car, rents will be limited, especially during the summer when the high season arrives (from late May to mid-September). But you will not have any problem if you are cautious, prepare your reservation in advance and know the alternatives of the island. Where would you like to rent the car? At the airport in Mallorca? At the city...? Depending on how you get to Mallorca (by plane or boat), you will be interested in renting the car closest to your arrival location. We have developed these guides in which we describe all the information you need, from which rental companies operate in each place, to what you should take into account when renting. So tell us, you will arrive to ...? We know how important it is to find out all the details about the rental and because each city is different, we provide you below with everything you need to know before making your reservation in Mallorca. How to rent a car in Mallorca? Is it really that difficult to rent in Mallorca? Renting a car in Mallorca is not more difficult than elsewhere. Just keep in mind that being a small island, the offer of rental cars is more limited and runs out sooner. Prices go up during the high season and it becomes the place in Spain where it is more expensive to rent a car. In seasons of high demand (from June to September) the units are limited and prices are higher. It is always better to book in advance. How far in advance should I book my rental in Mallorca? If you plan to travel to Mallorca during high season (summer months, Easter holidays and holidays), book your rental at least two weeks in advance. If your trip is planned for the second half of July or the first of August, you should even rent one month in advance. We recommend this because most likely smaller cars will run out easily, as they are cheaper and the most often selected. Can I change the reservation if the dates of my trip vary? With MyTripCar most reservations can be canceled or modified until the time of picking up the car. Each agency has its own policy: some do not allow canceling less than 48 hours before the pickup and others admit changes up to one hour before, such as Sixt. The good news is that most companies respect the price rate at the time you made the reservation. Some companies do not charge any additional fees for the modification, but others do, such as Sixt, which charges €20 per change. Keep in mind that if you cancel during high season, the car you had booked might not be available for different dates. Are there many queues and waiting times in the agencies of Mallorca? Waiting times can vary depending on the company (low costs have more traffic and queues), the season and the day of the week in which there is a greater number of customers (summer and weekends). At MyTripCar we have calculated the estimated waiting times for each company and you can check them before making your reservation. Rental agencies in the city of Palma, the airport and ports have waiting times of between 10 to 30 minutes before they can assist you, but at times of high demand it can take more than an hour. Is it cheaper to rent a car in the city of Palma de Mallorca or in smaller towns? Within the same rental company there is usually no difference, although it is easier that at the airport, having more competition, you will find more offers and a bigger variety of prices. Let's do the calculation for renting during the weekend in Mallorca at different places. In the airport and the port of Alcúdia the prices are identical: for example the cheapest rental would be a Ford KA at €104 with OK Rent a Car *. If you were to rent in Cala D'Or, the cheapest rental for the same dates would be €218 with Europcar *. * Prices calculated on 06/13/2017 for a weekend of July 2017, with full insurance. We recommend that you take everything into account before deciding, since a rental in a small town (plus the price of transportation there) may cost you more. What is the longest rental I can have in Mallorca? Maybe you are lucky enough to spend three months of summer in Mallorca, or for work reasons you need a car for a longer stay than the usual average. If this is your case, many companies offer you cars for long periods. However, it is very possible that they ask you to come to replace the car every so often, because companies need to rotate their vehicles to avoid wear and tear, and they also usually apply a quite expensive insurance. For example, it is possible to rent a car for 3 months in Palma de Mallorca, from a mini Ford Ka type to a large capacity vehicle like a Peugeot Partner. That quarterly rent would have a base price range between 2,800 and 12,000 euros *, depending on the model and the company. You would also need to add a premium insurance between 1,000 and 1,500 euros, recommended for such long rentals, since it is more likely that the car suffers any damage. What kind of car is best to rent in Mallorca? Being a holiday destination mainly, with mountain sections, difficult access to coves and an increase in traffic and shortage of parking during the summer, it is best to rent a small car if you are between two and five people. Some companies may have off-road vehicles and convertibles available, in case you want to treat yourself during your holidays and take advantage of the good weather, but they are more expensive and require a minimum age of the driver plus a complete insurance. Renting a minivan or van for more than 6 people will be somewhat less manageable and usually more expensive (between 700 and 1,600 euros a week, since they are more expensive and more risky). Is it difficult to find parking in Mallorca? If we add a large number of vehicles on a small island with many protected natural areas ... it is obvious that it will be difficult to find a parking space. This becomes a bigger problem during the summer, when there are more tourists in the city as well as in seaports and access to beaches and coves. Finding a space free of charge is usually an impossible mission, but sometimes also in the central blue zone. In the capital and the busiest localities you have private underground parking, but they will be quite expensive, up to €3 per hour. 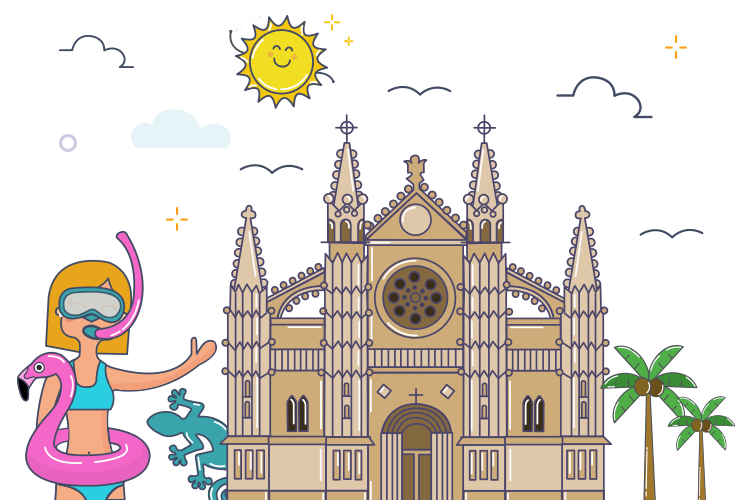 To explore Palma de Mallorca by foot, you can leave your car in the free parking lot of the Son Fuster Vell metro station, 15 minutes from the city center. How much does it cost to rent a car in Mallorca? The average price in Mallorca is very different depending on whether you travel in low season or in summer months with high demand. To get an idea, what is the cheapest 1 day rental in Mallorca? For example, renting at the airport in Mallorca during the high season, you could find the cheapest rental in OK Rent a Car, a Fiat 500 for €53... but with a card hold of €600 *. To reduce the hold, you would have to take a full-risk insurance, which with OK Rent a car leaves you with a one-day rental for €73 and no money withheld on your credit card *. * Prices calculated on 06/13/2017 for a one day rental of July 2017. Knowing the opinion of customers who have already rented with us in Mallorca is very useful to have an idea on how car rental companies are in the island. Avis Mallorca: Effective customer service. New and light cars. Many kilometers included. Friendly staff. Europcar Mallorca: Modern and well-equipped cars. Fast car pickup. More than enough kilometers included. Prices and extras a bit expensive. OK Rent a Car Mallorca: Long waiting times for the transfer to the airport office. Attention at the counter was slow as it was a busy time. Easy to pay with debit card. Sixt Mallorca: Higher prices, but a great variety of cars. Insurance rates quite expensive for models of greater range. Ignacio Álvarez Rented with Europcar in June 2017 It was my fault for not making the reservation well in advance and I was scared to see the few cars they still had available and how expensive they were. Isabel Heras Rented with Avis in April 2017 Without any doubt I can say the customer service was friendly, the minibus arrived in five minutes and in general everything was quite fast. The car seemed almost new. Andrea Jiménez Rented with Sixt in May 2017 To celebrate my bachelorette party in Mallorca I definitely wanted a Mini Cabrio, and Sixt was the company that had it for our travel dates. Guillermo Freire Rented with OK Rent a Car in April 2017 I had a bad day, of course. Everything was very slow, from the transfer to the office to the paperwork for picking up the car. It took almost an hour and a half between everything. Book with as much advance as possible. Being a small island, the offer of rental cars is limited and, as there is much demand, it runs out quickly, especially between June and August. Small cars are the cheapest and most comfortable to move around the island, but also the first to run out. Do not miss yours. Take a comprehensive insurance to prevent any charges derived from the slightest damage caused by the high number of tourists, number of cars and the increase in the number of accidents in July and August. In Palma de Mallorca there are usually cheaper rents than in ports and coastal municipalities. Compare before choosing where it suits you best. The main points to rent with the most variety of rentals on the island are the airport and the ports of Palma and Alcúdia. Remember that outside the airport there are low cost offices with very cheap prices, but they will charge you a high card hold if you do not take Excess Damage Waiver Insurance. If you want to move the car to another island in the Balearic Islands, check if your company allows it and what is the fee for taking the car in a ferry. Try not to leave any valuables in sight inside the car, since tourist destinations can be very common for thefts. If the crane removes your car, make sure to check which of the two municipal car deposits of Mallorca you should go to. What type of car insurance do I need in Mallorca? How can I rent a car without excess in Mallorca? How can I rent without a credit card in Mallorca? How can I rent a car in Mallorca if I am under 25 years old? How much does it cost to rent a full risk covered car in Mallorca for 3 days during the high season? Once in Mallorca, where can I park? What happens if they give me a traffic ticket in Mallorca? If I have problems with my rental agency, where can I place a claim in Mallorca? Can they deliver the car to the hotel? Can I take my rental car to another island in the Balearic Islands?